A high degree of pollination can be achieved using blue orchard bees if basic management guidelines are followed. The first step is to start with quality bees. Dormant bees are usually obtained in the fall or winter months prior to the spring in which they are going to be used for pollination. These bees are fully formed adults inside pupal cases, or cocoons, within nesting tubes. Dormant Osmia can be purchased as either inspected or uninspected bees. Inspected bees have been examined one at a time, and any parasites, dead bees, and unnecessary debris have been removed from inside the nesting tubes. Mud partitions that separate the individual bees inside the tubes are removed to facilitate rapid emergence. The inspector also insures that the cocoons are properly oriented within the tubes (click here to see a sample). Lastly, the numbers of female and male bees are indicated on the outer side of the inspected nest. A ratio of one female to 1.5 males (40% females) is desirable for sufficient mating. Unmated females will still produce nests and lay eggs but all of the offspring will be males. Obtaining non inspected bees can be somewhat of a gamble as there is no assurance as to what you are getting. The number of female bees will be unknown and may possibly be zero in many of the tubes. You could also be releasing parasites and diseases into your area. 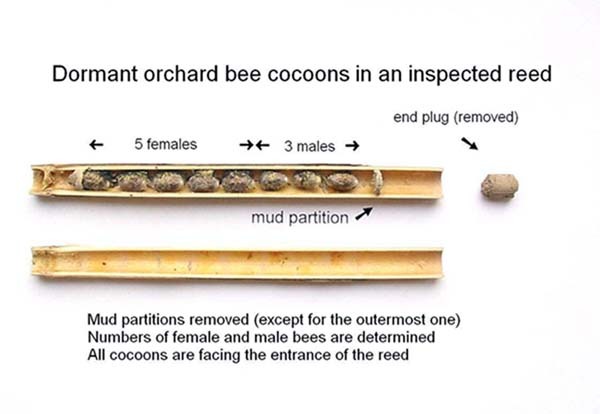 Because many different types of bees and wasps also utilize the same nesting materials, it is very possible that some nests may not even contain orchard mason bees. Inspected orchard bees are not necessarily more expensive than non inspected bees. Surprisingly, non inspected bees generally cost more than inspected bees when prices from various suppliers are compared. 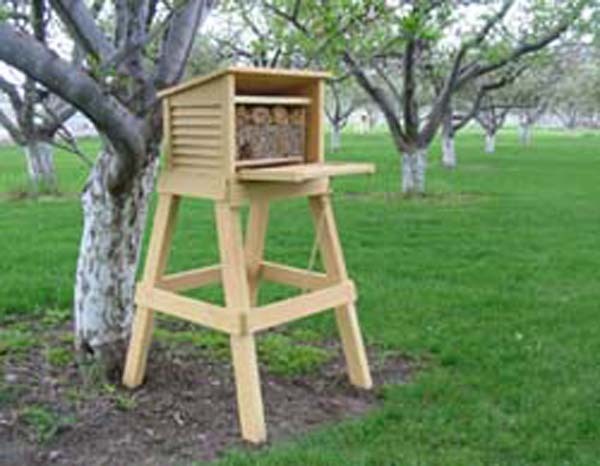 In early spring, dormant blue orchard bees and empty nesting tubes should be placed in a free standing field shelter. 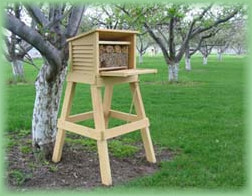 The purpose of the shelter is to concentrate the bees in a desired area while providing protection from wind and rain. 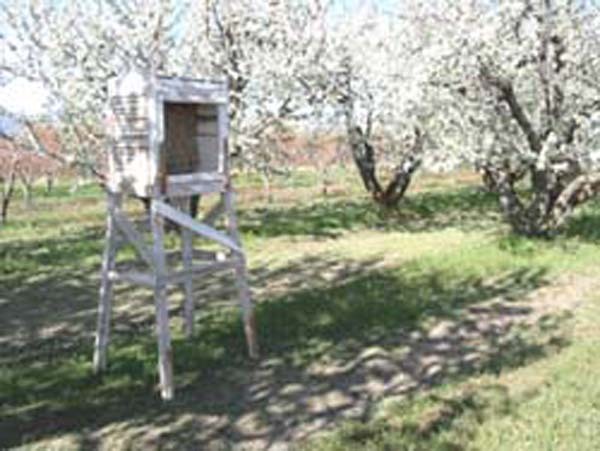 Small louvered shelters on elevated stands work well in small orchards. The best locations to position the shelter are on the north or west edge of the orchard. 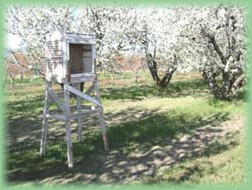 If the shelter is located inside the orchard, it can be placed next to a tree or where a dead tree has been removed so that it is out of the way of motorized equipment. Attaching the shelter to the side of a house or other building is not recommended. The shelter should be oriented to face the southeast direction so that the interior contents of bees and tubes are exposed to morning sunlight.